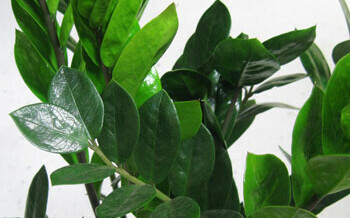 It is not often that a new variety of houseplant is introduced. Our industry was very excited when the Dutch nurseries began growing the ZZ Plant commercially in the late 1990’s. Since then this plant has enjoyed an ever -increasing popularity with interior landscape contractors, designers and house plant enthusiasts worldwide. This plant is very unique, with dark green, glossy oval leaves arranged in a herringbone pattern on thick stems. 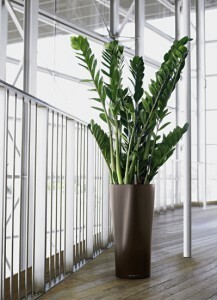 It can tolerate a wide range of lighting conditions which makes it a great tropical plant for office environments. In very low light, it will grow slowly, and the stems may be thin, which causes them to fall over easily. Because the ZZ plant is native to the dry grassland and forests of Eastern Africa, it prefers to dry out thoroughly between waterings. Depending on the light, the plant may not need water more than once or twice a month. We have had great success with this plant when it is grown in a container with a sub-irrigation (bottom watering) system. Overwatering will result in yellow leaves that drop off the stems. It does best in well-drained soil. The ZZ plant will avidly grow towards the light source (phototropism). Turning the plant regularly will keep it growing evenly and upright.